RestoraCalm® combines standardised magnolia and phellodendron with skullcap and passionflower. A combination of magnolia and phellodendron to relieve symptoms of stress, with skullcap and passionflower, both used in traditional western herbal medicine to relieve symptoms of mild anxiety and nervous tension. Relora® relieves symptoms of stress. 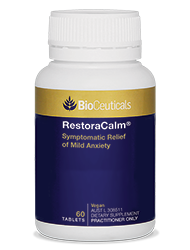 Relora® relieves symptoms of mild, temporary anxiety in premenopausal women. *According to use in traditional western herbal medicine. Adults: Take 1 capsule three times daily for a minimum of two weeks for best effect, or as directed by your healthcare practitioner.